The Dragon is a constellation of the northern sky, which can be observed all year. Draco is only viewable in the Northern Hemisphere, so people living in the Southern Hemisphere will not be able to see this long constellation. Its stars are not very bright, with only three stars above magnitude 3.0. It was one of the 48 constellations that the famous astronomer Ptolemy listed in his book and becomes one of the 88 modern constellations that last till today. The shape of the Dragon constellation is quite stretched out and therefore quite striking in the evening sky. It is especially easy to find, as it winds its way around the Big and Little Dippers. 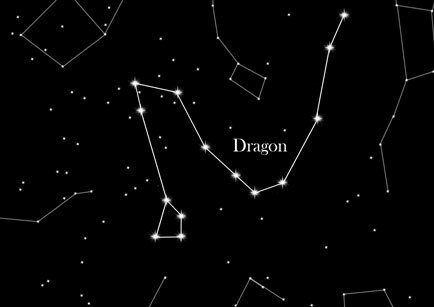 The easiest way to spot the Dragon constellation is to find its head. Its head consists of four stars lying north of the Hercules constellation. The Dragon constellation ends with Thuban, the pole star 4,000 years ago. In Greek mythology, the Dragon constellation represents the dragon that guarded the golden apple tree which represents eternal youth. Hercules defeated the dragon in one of his twelve labors and stole the apples from the tree. In Roman mythology, the Dragon constellation represents the dragon killed by the goddess Minerva and was tossed into the sky.